I’ve done some benchmarking and I know I need to change my marketing strategy, but I don’t know where to start! The team should be at least 3 people, but no more than 10. The people on the team can all be part of your company, or you can bring in someone from outside your company who is an expert (say your marketing account representative). Everyone needs to review the information on where you are now (why do you think the marketing strategy needs to change?) and where you want to go. If you don’t already have a goal, let the team help create the goal. Remember to use the SMART method! Specific. Measurable. Achievable. Realistic. and Timely. For example, if you want to change your market strategy to increase the number of people in the door, start with how many come in now (monthly). Then set an achievable goal – perhaps to increase this number by 10% in one year. Now comes the fun part – what are we going to do? Look at those in and outside of your industry. What marketing strategies are they using? Don’t let anything be thrown off the table right away. Look at all the different options and keep an open mind. An idea may seem like it has no place at your business, but one tweak and it can be the new hottest way to get business in the door! Now the experiment creation. Pick one or two (max) ideas to implement. You don’t want more as this won’t allow you to track which one is being the most beneficial and getting you to your goal. You can always come back and add on other ideas. This is why it is an experiment. Another reason, is because you will implement these for a short time period and review your results. Did the ideas work? If so, add another idea to see if it helps. If not, stop doing it and try something else. 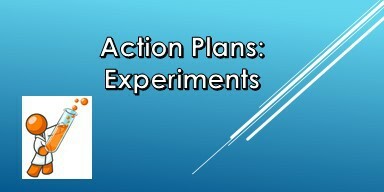 A key in these experiments and action plans is assigning responsibilities and following up on the decisions made. Who will implement the idea(s)? Who will track their effectiveness? When will the team meet again to review the results of each experiment? With these steps you can accomplish almost ANY goal you set your mind to. Just remember not to try to tackle too many things at once! Too many experiments at one time can lead to lost productivity and problems in other areas that have lost focus. If you need help with setting up an action plan or experiment, or need another member on your team to help with implementation, please reach out to us! C Business Services can help! Designed by BEACON Media + Marketing, © 2019. All rights reserved.